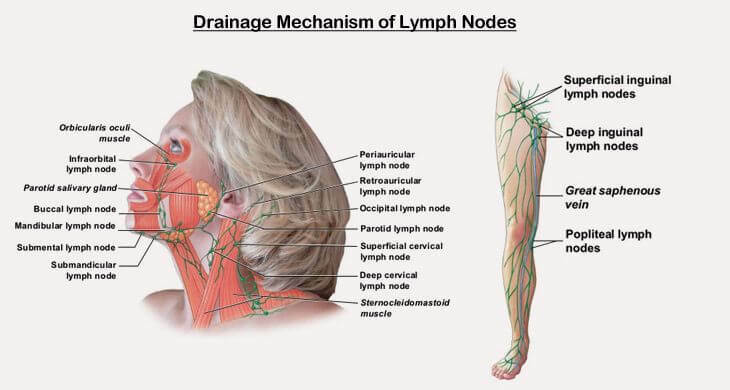 Do you know what are lymph nodes? Which is their function? Here you will get answer to several different questions like these. Humans generally have immunity against pathogens and accidental infections. The lymph nodes definition indicates that it is because of the presence of lymph nodes. These entities form a part of the lymphatic system. They behave like mechanical filters. The job of these mechanical filters is to kill and eliminate microbes present in the blood stream. The white blood cells (WBCs) or lymphocytes are produced by the lymph nodes. On the other hand, WBCs kill bacteria and viruses entering the body. Lymph nodes are very small organs, measuring only about 1-2 cm in size. They form a network throughout the body. There are about 500 lymph nodes spread across various organs of the human body. A lymph node gets its particular name from its location and relation with the body organs. For example, the cervical lymph nodes are present in the neck or cervical region of the body. They protect the tonsils and the pharynx. Here you should note that swollen cervical lymph nodes is an indication of the lymphatic system disease. Lymph nodes in armpit are the axillary lymph nodes. Their job is to drain the chest region. You will find the mediastinal nodes near the sternum and the lung sacs. Meanwhile, for the drainage of the abdominal organs, there are the mesentery nodes. Lymphatic System a Sewerage System: It won’t be wrong to compare the lymphatic system to a sewerage system. It has a networks of pipes to drain waste from every single body cell. The pipes in this system are defined as lymph vessels. The job of these vessels is to transport clear interstitial body fluid, that is, the lymph. The Function of Lymph: The lymph is a watery fluid that flows in the lymphatic vessels. Its function is to help in effective draining mechanism. Coordination of Drainage Mechanism: It is the muscles movements that coordinate the entire mechanism of draining. It is particularly because the lymphatic system has no specific pumping organs. Bulging of Lymph Nodes: The lymph nodes bulge out in the presence of an infection. It is because, in case of an infection, they have to work hard to get rid of it. Complementary Organs of Lymph Nodes: There are many organs in your body which protect the lymph nodes. They include spleen, tonsils, thymus and the adenoids. In addition to playing a protective role, these orangs are also complementary to the lymph nodes to form the immune system of body. Lymphatic Circulation: About 2 liters of lymph fluid circulate in the body every day. During circulation, the lymph collects, destroys and eliminates foreign agents. Meantime, it also deals with the disease causing microbes. Types of Lymphocytes: There are two types of lymphocytes or white blood cells that the lymph nodes produce. These are the B & T lymphocytes. The B-lymphocytes target bacteria and some viruses. Whereas the T-cells attack viruses in your body. The understanding of “What are lymph nodes?” is essential to know about the natural defense system. The lymphatic system behaves like a middle-man between the tissues and the blood vessels. The tissues transport impure or deoxygenated blood back to the blood stream. The purpose of doing so is to oxygenate the blood. Meanwhile, the lymphatic system collects the microbes and impurities. So, the blood becomes free from harmful substances and other disease causing agents. Finally, it enters back into the blood stream. The lymph nodes function like sewers and extract pathogens from the blood stream. Just like blood capillaries, there are lymphatic capillaries. They absorb the interstitial fluid that enters the lymphatic system. The purified liquid then goes back into the cardiovascular or blood circulatory system for oxygenation. 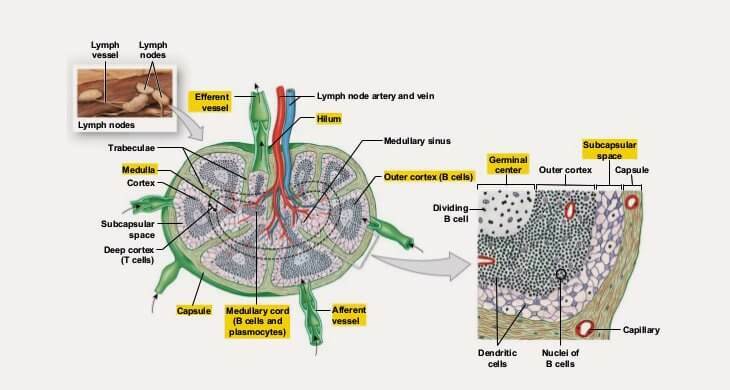 Here is further detail about “What are lymph nodes?” Lymph nodes also serve as the major factories of the body. That is, they synthesize the white blood cells – the defense force of body. The white blood cells are responsible for auto-immune response. Also they target & eliminate infections at different locations in the body. What are lymph nodes diseases? Obviously, these are the conditions that affect the major organs of the lymphatic system. Consequently, the lymph nodes are unable to perform their job effectively. Here are a few of such conditions. Hodgkin's disease is one of the serious lymph nodes disorders. It is a type of lymph nodes cancer. In this carcinoma, the lymphocytes are commonly affected. On the other hand, the victim with this type of cancer becomes vulnerable to many other diseases. Actually, there is the partial or complete destruction of the immune system. After the appearance of lymph nodes cancer symptoms, you can manage it with radiation therapy and medication. But the prognosis is usually poor. Lymphadenopahty is the medical term for the condition of swollen lymph nodes. Lymph nodes often swell up in the presence of an infection or tumour of the adjoining organs. It is also one of the main symptoms of many abnormalities and disorders of the body. Depending on the location of the swelling, the physicians can diagnose the exact disease in the body. For example, nodes in the armpit swell in breast cancer. How do you know if you have swollen lymph nodes? What are lymph nodes swellings and how to diagnose them? This is one of the questions that the people ask about the natural filters of your body. Sometimes, there is inflammation on the nodes. You can locate the swelling through the sense of touch. Just place the fingers of your hand on the suspected area. Try to feel the lumps with pain and tenderness. How big are the lymph nodes in your neck? Usually, the size of the nodes varies depending on their specific location in the body. What is the normal size of lymph nodes in your neck? Normally, the lymph nodes in your neck may measure the size of a pea or kidney bean. Meanwhile, you should note that swelling can make them grow much bigger. What causes enlarged lymph nodes in the chest? Sometimes, the diseases in nearby organs of the body cause enlargement of the lymph nodes. For example, sarcoidosis is a condition which may lead to inflammation of the lymph nodes in the chest. In addition, it may be responsible for the swelling of the nodes in the neck, armpit and groin.